As much as I love getting meals in the freezer for my family, I’ll admit that doing my mega freezer cooking days while pregnant with Benjamin David and immediately following his birth was difficult. But now that I can do amazing things like bending over, I am anxious to enjoy my long days of prepping freezer meals again! As I began this large family freezer cooking day, I had a plan. Of course, in a family of 10, I use the word “plan” very loosely. Let’s call this the “Jamerrill has had 2 cups of coffee and can bend over again” plan. It was optimistic, so you’ll see how much I actually accomplished. 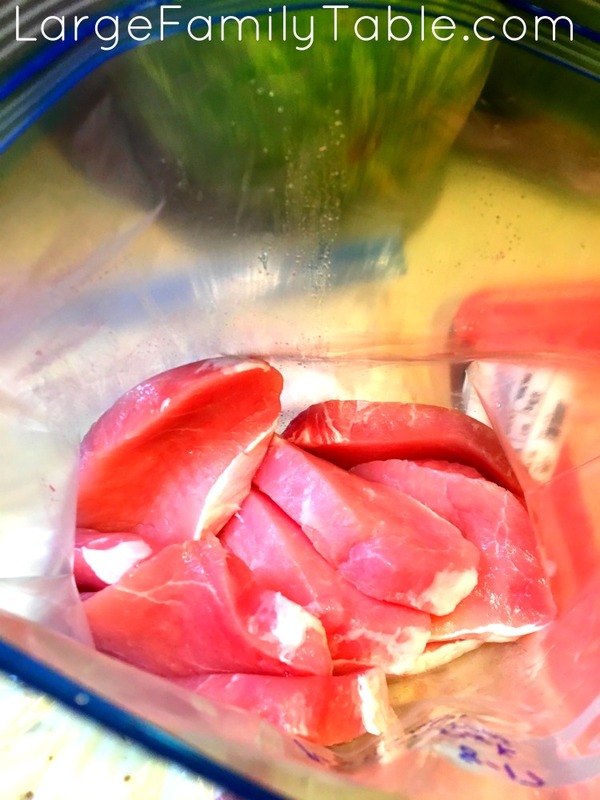 I did have a head start thanks to a Youtube viewer, who suggested I start my meat in my slow cookers overnight. I began this day with 10 lbs of both ground beef and chicken already cooked. 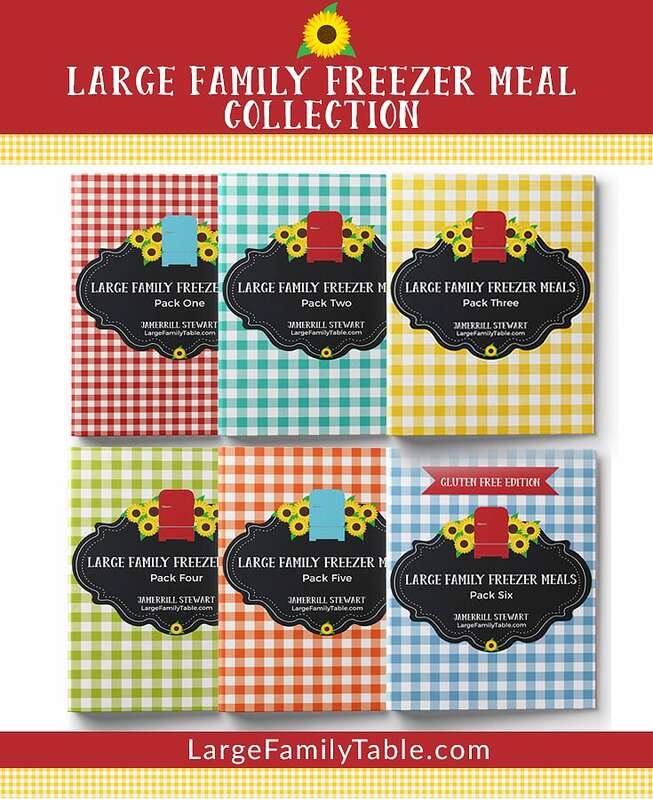 One thing to keep in mind here is that although I call this 4-6 weeks worth of freezer meals, it all depends on your family size as to how long these meals last. My numbers are based on having one 13 x 9 pan of food for your evening meal each night. If you do leftover nights or anything else for dinner, or if your family is large and uses more than one pan per night, you can stretch these meals in different directions. At this moment in time, we have five adult-size eaters and four child-size eaters. 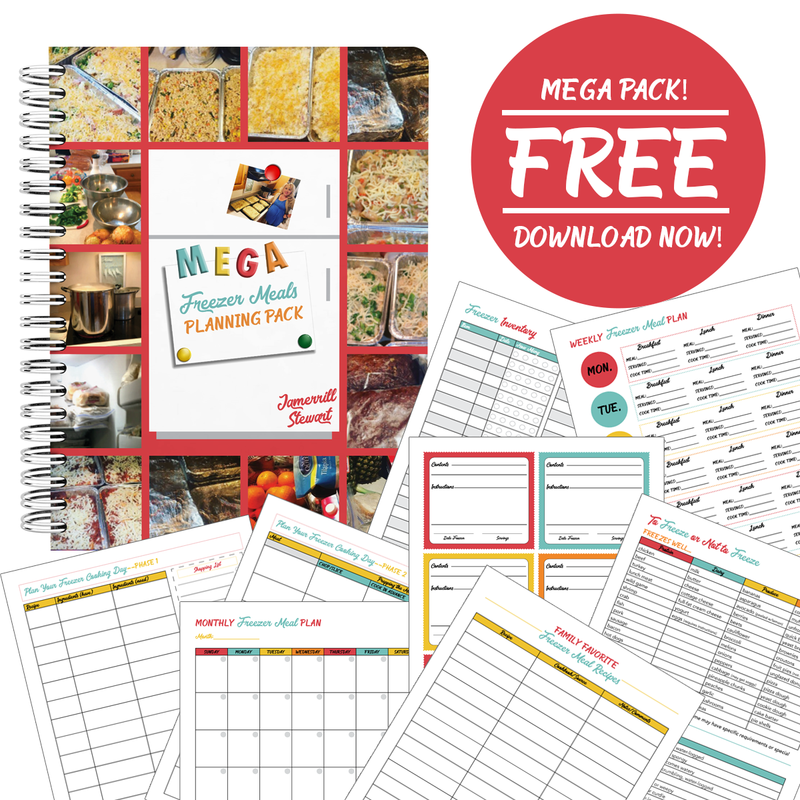 I plan for these freezer meals to last us a solid 4 weeks, then I do pantry challenges or “clean out the frig and freezer” weeks before we load up at the grocery store again with another large family grocery haul. I love having the kids help me in these freezer cooking days. Naomi was on the job making our sandwiches for the freezer this time, and Zion helped with veggie prep and making some of our breakfast items. Baby Benjamin did a great job wanting to nurse which gave this Mama some “sit down” time during a crazy busy day of freezer cooking. I am a huge believer in using my kitchen “servants” to make these mega freezer cooking days easier. Things like slow cookers and instant pots can be working behind the scenes, cooking rice, meat, potatoes, etc. while I am busy prepping more hands-on type dishes. You’ll see me using both in this session. Here’s my Amazon affiliate link (which helps support my online efforts) for a 7 Quart Crock Pot brand slow cooker on Amazon! 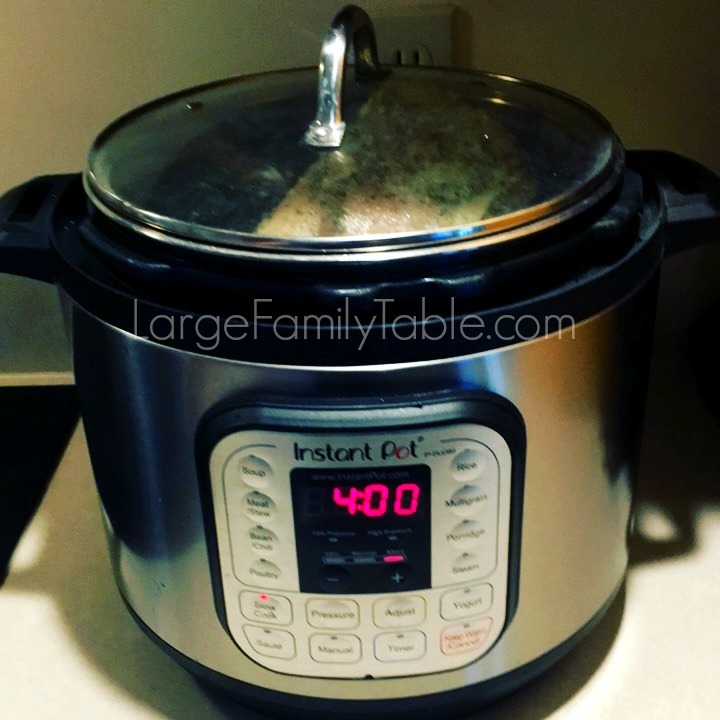 And here’s the 8 quart Instant Pot I use. On this particular day, I made several freezer meals of raw meat in baggies with various sauces and spices. On the day we plan to eat one of these meals, I put the meat in the slow cooker in the morning and add in the veggies later on before we eat. For example, I did beef and broccoli in this cooking session. The beef will cook for several hours in its sauce, and I will add the broccoli about 30 minutes before it’s done. As far as my breakfast breads go, I have several types that I make for my family, and I make them all basically the same. Whether it’s blueberry, applesauce, banana or cinnamon-sugar bread, we enjoy these for breakfast with fruit, yogurt, or a glass of milk. 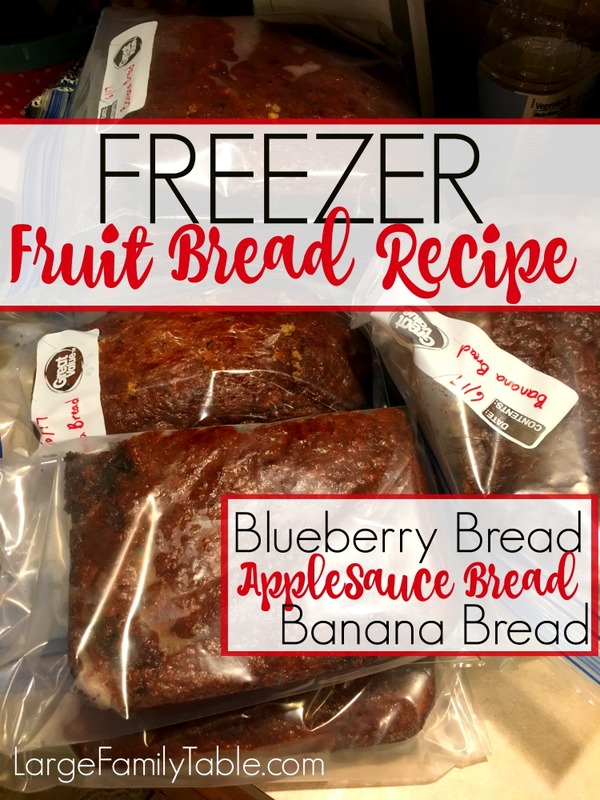 Here’s my Freezer Fruit Bread Recipe. 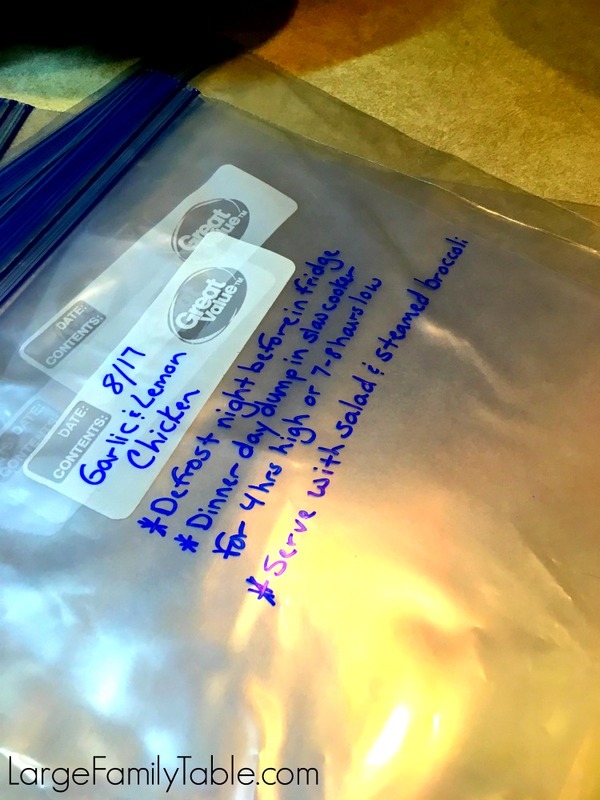 This freezer cooking day was a challenge on many levels; I got started later in the day than I would have liked and because it was a rainy day, the kids were inside more than they usually would on a mega freezer cooking day. My husband usually takes the younger kids out and about for me on these cooking days, and somehow we were both off our game. I claim it was still new baby fog as Benjamin was about 8-weeks old when I pulled off this cooking. 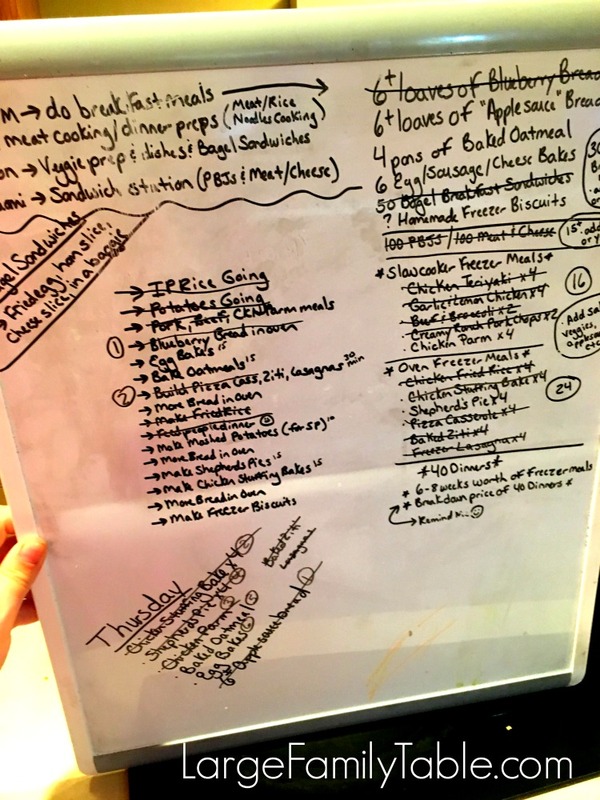 This led to mini freezer cooking sessions on a second…and third…and fourth…cooking days to try to finish up all of the meals on my list. While I’m sharing, let me share a “true confession.” I completely forgot to add any sweetener and possibly another ingredient to half of the breakfast breads when I mixed them up. I knew the loaves looked odd, so I tasted one. Yuck. That’s what happens when mama gets distracted by a cute little boy named Daniel. I also realized, too late, that the ground beef that I cooked for the shepherd’s pies was all used in the lasagnas and baked ziti. The problem with that was I cooked 16 lbs of potatoes to top the shepherd’s pies with. So those potatoes turned into potato soup instead. And I gave up on the shepherd’s pies. Oh well. When an accident with a teen and the dog led to an evening at the ER (said teen fell on a rock while running through the forest with the dog…we thought possible broken elbow…just a sprain but who knew! ), plus with more family visiting from out of state, I decided I had done what I could and called it good. I ended this mega freezer cooking session over several days with 36 dinners, 30 breakfasts, and 15 lunches. Not bad for my big mega-cooking comeback where I can bend over again! 50 Ham, Egg, & Cheese Breakfast Bagels we divided these into bags of eight. This made for about 6 breakfasts for our family. 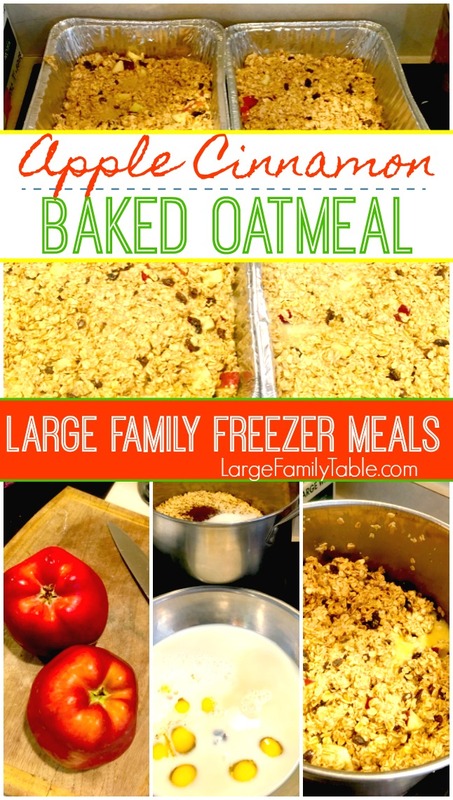 4 – 9×13 pans of Apple Harvest Baked Oatmeal perfect for big family breakfast or to freeze in individual servings. 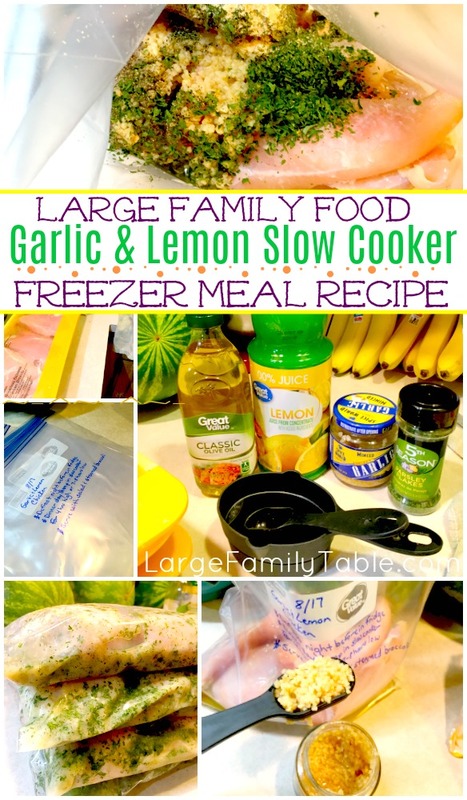 Garlic & Lemon Chicken Slow Cooker Freezer Meal Recipe – makes four large family style slow cooker dinners! This one is super healthy as in low carb and Trim Healthy Mama friendly, too. Large Family Slow Cooker Chicken Teriyaki Freezer Meal Recipe – we had to have this meal recently served on disposable plates due to a broken dishwasher. It was still perfect! Easy Creamy Ranch Pork Chops | Freezer Slow Cooker Meal – I made two of these Easy Cream Ranch Pork Chops. I believe (if I remember correctly) I only made two packs based on the amount of pork I had available. 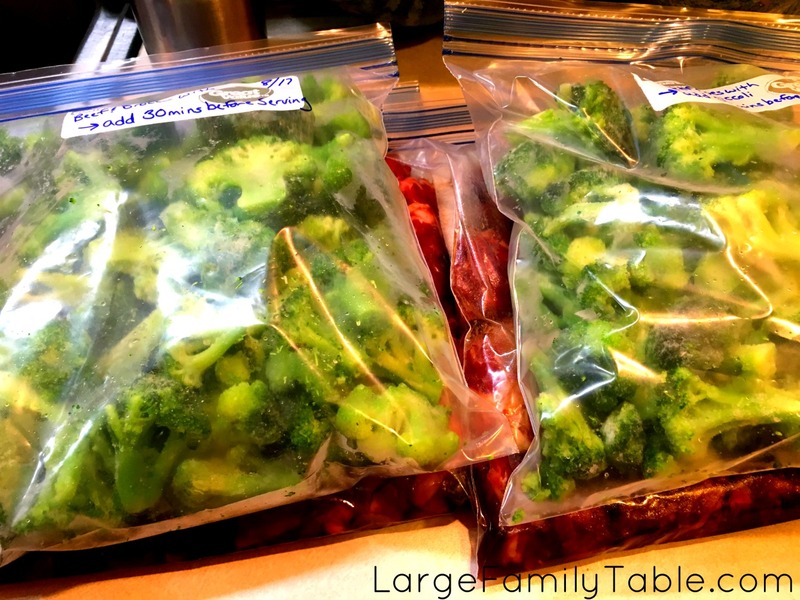 Broccoli and Beef Slow Cooker Freezer Meal – Large Family Style! – If your family loves Broccoli and Beef, then this is the recipe for you! 20 Easy Oven Freezer Meals – Large Family Style! 4 Pans of Pizza Casserole -That’s right, it’s a casserole oven bake, it’s freezable, and it has the word “Pizza” in its name. As our usual, we also did over 100 Freezer PBJs and over 100 Ham & Cheese “Grill Me Later” Grilled Cheese sandwiches (the only adaptation to this recipe is slipping on a slice of ham).
? ? ? Jamerrill, What Do You Eat In A Day? ? ? ? I get asked for examples of how we use these freezer meals in real life and if freezer meals are “all we eat.” Even with a freezer full of quick freezer meals we still add a lot of other fresh foods to our days. 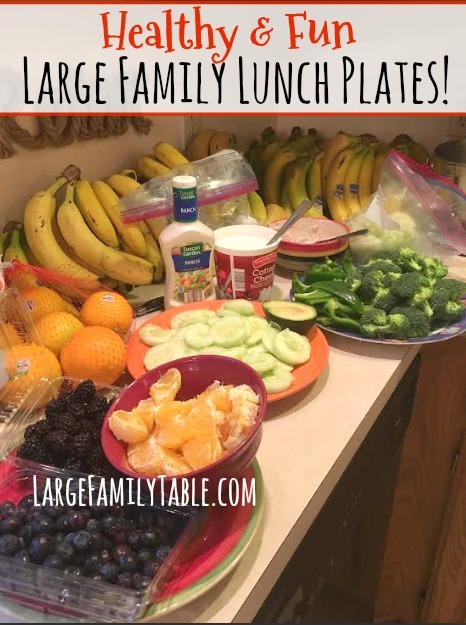 However, having large family freezer meals prepped helps me as a large family mom in daily life managing a house full, homeschooling, and running a business. I can’t shout from the rooftops enough how helpful they have been! Lunch: If we’re home having a settled homeschool day I like to set a hodgepodge of various items out, kinda like a lunch buffet, and let each kiddo pick what they want on their lunch plate. I’ll throw any leftover “must-goes” on the counter if available, fresh apple slices (my hubby is an apple slicing ninja), clementines, broccoli/cauliflower slices (it varies with what veggies are prepped) choices of yogurt or cottage cheese, etc. If we’ve spent the morning hiking or have appointments or field trips outside of the wilderness, that’s when I like to pull out a stack of frozen Peanut Butter & Jelly sandwiches and grab a bag of apples for the road. Snack: Fruit (my kiddos usually gravitate toward an afternoon snack during our read-aloud time). I like to add some protein in like an apple with a spoonful of peanut butter or an apple and a cheese stick. Dinner: Garlic & Lemon Chicken in the slow cooker (Or insert any of my freezer meals here), steamed carrots, brown rice, applesauce. 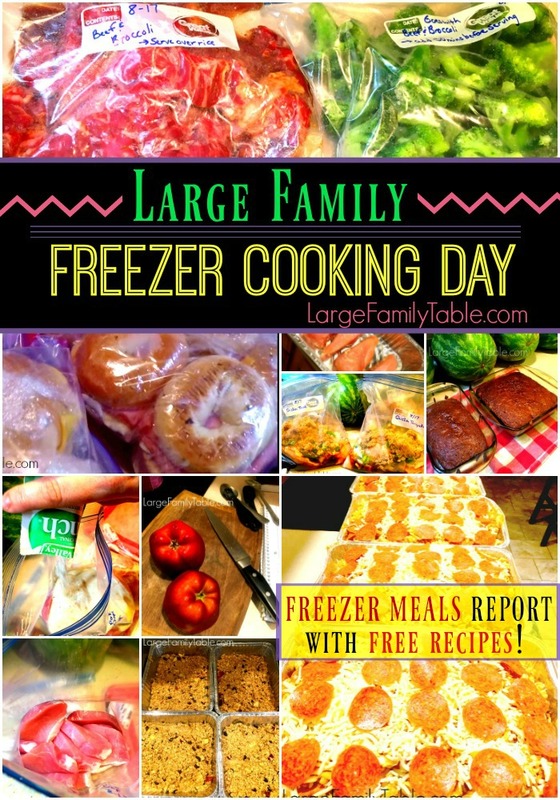 Click here to watch the full LARGE FAMILY FREEZER COOKING DAY | Breakfast, Lunch, Dinner Freezer Meals on YouTube!